Memory cards are difficult to buy, but the choice of a memory card is easy if you own a Nikon D7000. The only thing left to decide is what sizing of card you'd like to buy. Sandisk and Nikon worked together to produce an SD memory card that can work faster with the Nikon D7000 than any other SD memory card. 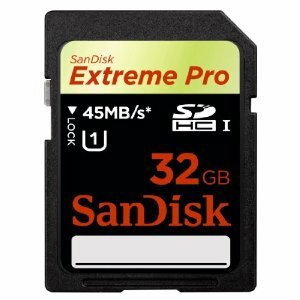 In the search for faster and faster memory cards, you may be surprised to know that often a faster memory card will provide no benefit to your camera's speed. It works like a bottleneck. When the camera takes a picture, the sensor captures information and passes it to the buffer, and the buffer passes the information to the memory card. If the processor in the camera is slow, using a faster memory card won't make a bit of difference in speed. In many cases, however, the memory card is the weak link in the chain. With that understanding, you might be interested to know that the new Nikon D7000 is the only DSLR on planet Earth that can take advantage of the new UHS technology in SD memory cards. Unlike most SD cards that max out at 20 megabytes per second maximum write speed, the new Sandisk UHS memory card can be fully used by the Nikon D7000. Other DSLRs will see no benefit in using this card rather than a regular class 10 memory card. If you own a Nikon D7000, this is THE best memory card for your camera… no question. Buy this memory card on Amazon.com. In fact, buy two since the Nikon D7000 has two memory card slots. You can also buy it in 32gb or in 8gb sizes. Sandisk has had this type of exclusive with Nikon DSLRs before. The D90 was only able to use the power of the 30 megabytes per second SD card made by Sandisk, and not similar SD cards made by other manufacturers.